Little Lungs just can’t breathe easy. That’s because Little Lungs—the star of FCB New York’s cute stop-motion PSAs for the Food & Drug Administration Center for Tobacco Products—smoked as a teenager and never grew to normal size. At times, our hero resembles conjoined baked potatoes. In fact, he’s a pair of anthropomorphic lungs with googly eyes. 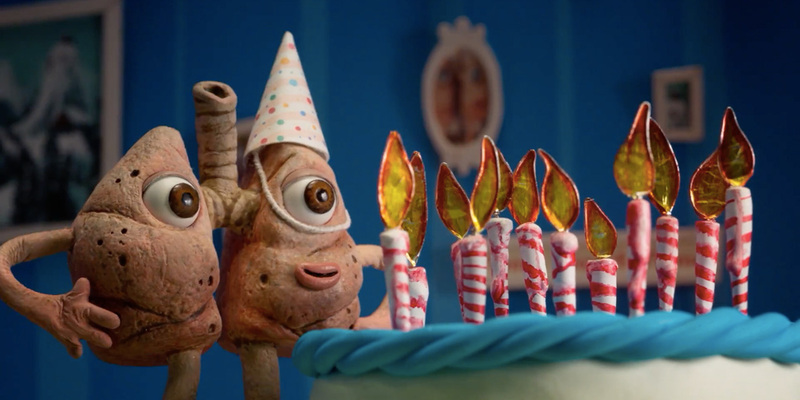 Hornet’s Peter Sluszka directed five zippy online ads, which show Little Lungs struggling to keep up with his healthy pals. At the close of each commercial, he meets a yucky-comic fate, Celebrity Death Match style. You’ve gotta wonder just how many more birthdays he’s going to see, right? Of course, lungs—real lungs—have appeared in anti-smoking spots many times before. Sometimes, these are sickly, seared organs, shocking to behold. While Little Lungs eschews such terrifying tropes in favor of a softer sell to communicate “The Real Cost” of smoking, his adventures “in a great big world” match up well with teens’ everyday concerns. Teens want to enjoy fun activities and be accepted by their peers. The notion that smoking might ruin their leisure time or social lives could make some think twice before lighting up. And while extremely cute, the ads have just enough icky edge to promote sharing and deliver their thoughtful message. Take, for example, the bicycle and pool-party scenarios below, which both go badly awry. Yo, Little Lungs, look out for riding mowers and—gasp!—sharks.